Surely some Joey routines are worth covetting. BTW, did you know Joey Grimaldi (at least) once played Punch on stage? Can anyone translate this back into Standard English? Scotch is so confusing, if rather warming! Oh, dear, I do wish that some of you, south of Watford Gap, would develop the intellect not only to understand the English language, but to appreciate the insult Not only of 'Scotch' To our Scots bretheren, but also of the implied insult, via the drink reference, and to those of us 'Northerners' who are roughly equidistant to both the'capital' and the Scottish borders! It is little wonder that traffic on this board is so slight when half the contribution is the lowest form of wit. - If you truly require a translation try, " Read the previous posts, and reply to the points raised in the hope of a little banter on the board. Alternatively, - reply with an infantile personal slight, and hope that those rumours of violent Northern people who are quite mobile enough to be knocking on your door about.......NOW! aren't true Beyond which, (In English) Compliments of the season to all !! PS, - Is it me, or is there a post missing here somewhere??? Last time I checked Birkenhead was a long way north of the Watford Gap. Feel free to come knocking John. There's a silver Swazzle buried in one piece of the Christmas pudding. Hi all... havent been here for ages but popped in today to peruse the board as I am preparing to give a show for one of my grandchildren soon. 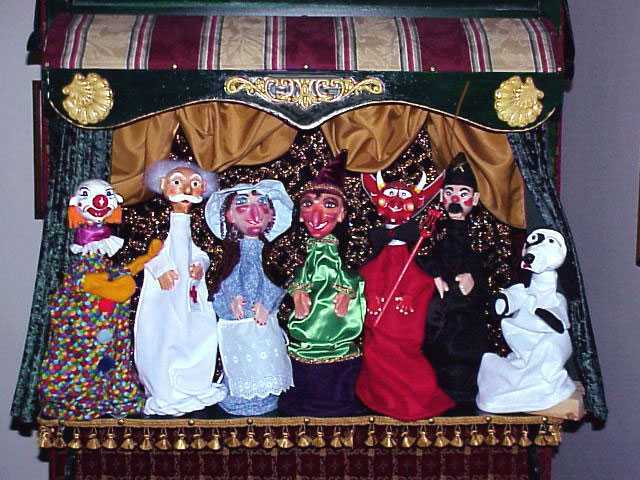 My question is why not paper mache puppets??? My reading of this is that CVDC's piece is tongue-in-cheek, and that the PM bit takes a poke at 'arty' PM puppets, which I interpret as a criticism not so much of the construction technique of the figures themselves, although there is a bias against PM, but of the 'arty' and possibly sometimes even 'arty-farty' (a technical term of P&J evaluation) concepts behind such shows, when artists, and I use the term loosely, zoom in on P&J, come up with some weak concept, deliver some rubbish, and move on to do an injustice to something else. The pros and cons of PM have been discussed often on this board, might be interesting to dig them out and read again. Not sure I agree with John's point about the speed of PM, it varies depending on technique, and of course drying time must be considered, but if you know what you are doing, carving P&J in wood is probably much quicker. But PM is very accessible, and it is modelling, which is additive (is that a word) and to me that seems more understandable, rather than sculpture which is subtractive. The main point about PM is that anyone can have a go . Its probably the first way anyone making puppets starts. I certainly did. But that is not to say it is in any way a lesser medium that carving wood. Anyone unfamiliar with the work Les does, will not appreciate what an absolute genius he is with his PM creations , both as puppets and other non punch related sculptures. He does not merely make in PM what could otherwise be made in wood ...the shapes and heightened style of his works could only be done in PM in many ways.
" ...come up with some weak concept, deliver some rubbish, and move on to do an injustice to something else."" I think we have all met the type ! Many thanks for those very generous comments Richard, I think I may now retire while I am still ahead. As regards the Arty and Arty-Farty approach, I think I may have moved away from CVDCs intended point, but I just found myself 'going off one one'. I have recently been reading a good book on PM, it has a fascinating history, and as we both agree it is so simple to get into and develop one's own approach. The Book is; The Art and Craft of Papier Mache by Juliet Bawden, published by Mitchell Beazley, orig about 1990 a quick look shows loads on amazon and ebay for very little money. All the best, I am away on holiday tomorrow for a week in Robin Hoods Bay, a mental break, and fortunately no chance to bid on the loads of Punch sets available soon on ebay, though none really grabbed me. Regular readers who have suffered my many postings on the subject know that I am an great lover of Papié Maché, and have also maintained that properly used it can be as strong as, or even stronger than wood. One can forgive Chris vdC for his jocular dismissal of the Papié Maché method with those who find Punch 'meaningful', since he is trying to sell carved wooden figures. At least he was. This resurrection by Lazarus of a three year old posting from CvdC made me think how long it is since we heard from him. Not only has he not been posting - which goes for a lot of people who apparently prefer Farce Book and Splutter - but also he doesn't seem to have been advertising his puppets for sale. And of course we haven't seen him at the May Fayre for a couple of years. I hope he's OK. Anyone had any correspondence with him? June 19th 2014 seems to have been CvdCs last posting on here . I looked it up by clicking his name. A useful feature that. I have had emails from CvdC since then and am pretty sure he is still carving and making like a good-un down in Oz. His step by step photos and plans for building a lazy tongs booth are still to my mind the best documentation of the process for anyone wanting to give it a go themselves. No big surprise I think that he hasn't been to a few mayfayres when you consider the huge expense it must be for him to fly here from the other side of the world , and put himself into accommodation . Even to the most hardy enthusiast , once you have seen one mayfayre , then they are fairly alike ( with obvious year to year cast changes of course) ...but then CvdC has been to 3 or 4 I think ? An occasional visit , rather than ever year, would probably satisfy his needs now. Still , yes an email to Oz is probably overdue. I do manage to have a look at this board on occasion. It is nice to see what is discussed but have not seen an opportunity to contribute; well, at least not anything that I have not said before. The photo above inspired me to jokingly come up with a suitable range of commandments a Punch and Judy fundamentalist could aspire to. So poor old Lazarus will go to some sort of Punch and Judy hell for his sin. I have just made a devil with which to prod him through hell's mouth. It is based on that one so often seen on ebay, behind the brutal paintwork of which lurks a well carved puppet. Great to see you CvdC. With a very shaggy fur type of body ? I am sewing a new Judy dress and body right now. But I rediscovered the fabric I had hoarded away for this little job , and I just fancied getting stuck into doing it. Its a cold drizzly day , so I cannot work on the shed. Sewing indoors in the warm seemed a nice option. How is Oz ? must be high summer for you CvdC. Last edited by Richard Coombs on 08 Feb 2015, 19:05, edited 3 times in total.